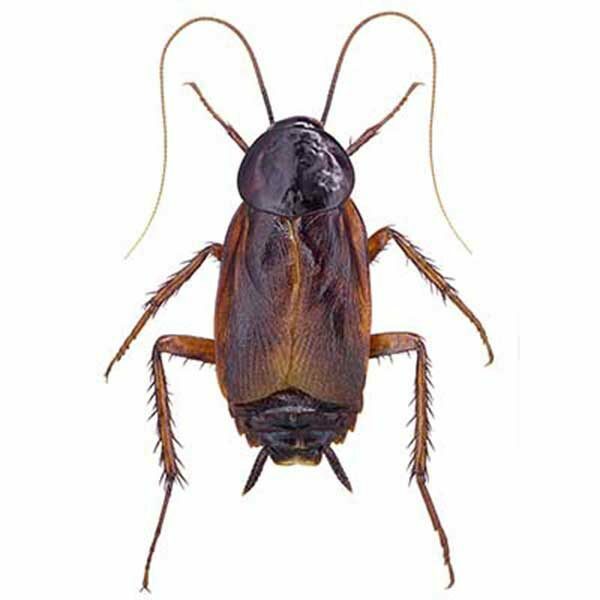 The oriental cockroach (Blatta orientalis), also known as the waterbug or black beetle, is a large species of cockroach, adult males being 18–29 mm (0.71–1.14 in) and adult females being 20–27 mm (0.79–1.06 in). It is dark brown or black in color and has a glossy body. The female has a somewhat different appearance from the male, appearing to be wingless at casual glance, but is brachypterous, having non-functional wings just below her head. She has a wider body than the male. The male has long wings, which cover two-thirds of the abdomen and are brown in color, and has a narrower body. Both sexes are flightless. The female oriental cockroach looks somewhat similar to the Florida woods cockroach, and may be mistaken for it. Originally endemic to the Crimean Peninsula and the region around the Black Sea and Caspian Sea, its distribution is now worldwide. 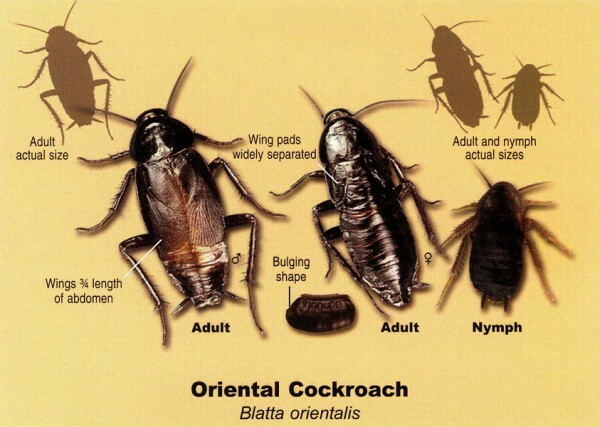 Oriental cockroaches tend to travel somewhat more slowly than other species. They are often called "waterbugs" since they prefer dark, moist places. They can often be found around decaying organic matter, and in sewers, drains, damp basements, porches, and other damp locations. They can be found outside in bushes, under leaf groundcover, under mulch, and around other damp places outdoors. They are major household pests in parts of the Northwest, Midwest, and Southern United States.